This article is about the statistical records of the New York Yankees. For their season-by-season win–loss records, see List of New York Yankees seasons. 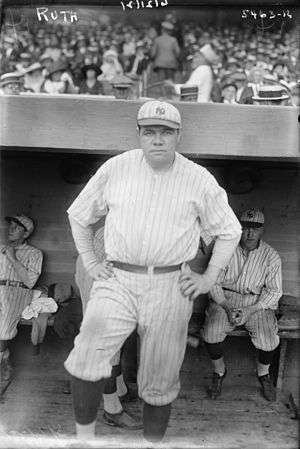 Babe Ruth holds sixteen franchise, four American League, and two Major League records. The New York Yankees are a professional baseball team based in the Bronx, New York. They compete in the East Division of Major League Baseball's (MLB) American League (AL). The club began play in 1903 as the Highlanders, after owners Frank Farrell and William S. Devery had bought the defunct Baltimore Orioles and moved the team to New York City; in 1913, the team changed its nickname to the Yankees. From 1903 to 2016, the franchise has won more than 10,000 games and 27 World Series championships. The list below documents players and teams that hold particular club records. Outfielder Babe Ruth holds the most franchise records, with 16, including career home runs, and career and single-season batting average and on-base percentage. Shortstop Derek Jeter has the second-most records among hitters, with eight. 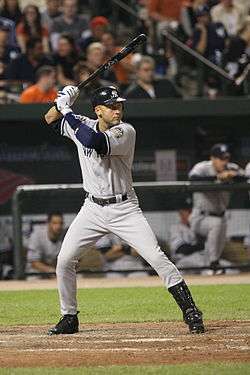 Jeter's marks include the records for career hits, singles, doubles, and stolen bases. Among pitchers, Whitey Ford has the most Yankees records with five, all of which are career totals. These include games won, games started, and innings pitched. Several Yankees hold AL and MLB records. Ruth has MLB single-season records for extra-base hits and total bases, and holds four other AL single-season records. 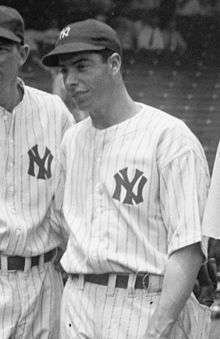 Outfielder Joe DiMaggio recorded hits in 56 consecutive games in the 1941 season, a total that remains an MLB record. Jack Chesbro holds three AL records that he set in 1904: games won, games started, and complete games. Statistics are current through the 2016 season. These are records of players with the best performance in particular statistical categories during their career with the Yankees. Derek Jeter is the Yankees' all-time leader in hits, singles, doubles, and stolen bases. Mariano Rivera has the most saves, both in his career and a single season, among Yankees pitchers. These are records of Yankees players with the best performance in particular statistical categories during a single season. Joe DiMaggio has held the MLB record for the longest hitting streak since 1941. 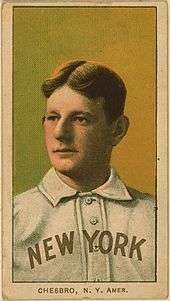 Jack Chesbro won an American League-record 41 games in the 1904 season. These are records of Yankees teams with the best performance in particular statistical categories during a single game. Hideki Matsui hit two of the Yankees' eight home runs on July 31, 2007. These are records of Yankees teams with the best and worst performances in particular statistical categories during a single season. 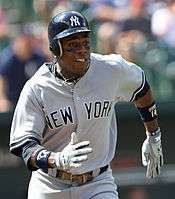 Curtis Granderson hit 43 of the Yankees' 245 home runs in 2012.
a Earned run average is calculated as 9 × (ER ÷ IP), where is earned runs and is innings pitched. b The figure listed is the MLB total. Baseball-Reference.com credits Rivera with 952 games finished. ↑ "Yankees Timeline: 1900s". New York Yankees. Retrieved November 14, 2015. 1 2 "Complete Baseball Team and Baseball Team Encyclopedias". Baseball-Reference.com. Retrieved February 13, 2009. 1 2 "New York Yankees Batting Leaders". Baseball-Reference. Retrieved February 7, 2009. 1 2 "New York Yankees Pitching Leaders". Baseball-Reference.com. Retrieved February 7, 2009. 1 2 3 4 5 6 7 8 9 10 11 12 13 14 15 16 "Babe Ruth Statistics". Baseball-Reference.com. Retrieved February 7, 2009. 1 2 3 4 5 6 7 8 "Derek Jeter". Baseball-Reference.com. Retrieved November 19, 2009. 1 2 3 "Lou Gehrig Statistics". Baseball-Reference.com. Retrieved February 7, 2009. 1 2 3 4 5 "Whitey Ford Statistics". Baseball-Reference.com. Retrieved February 7, 2009. ↑ "Mel Stottlemyre Statistics". Baseball-Reference.com. Retrieved February 7, 2009. ↑ "Johnny Allen". Baseball Reference.com. Retrieved November 5, 2010. ↑ "Rich Gossage Statistics". Baseball-Reference.com. Retrieved February 7, 2009. 1 2 3 4 5 "Mariano Rivera Statistics". Baseball-Reference.com. Retrieved February 9, 2009. ↑ "Career Leaders & Records for Saves". Baseball-Reference.com. Retrieved December 5, 2011. 1 2 "Andy Pettitte Statistics". Baseball-Reference.com. Retrieved July 2, 2013. ↑ "Statistics" (To sort, click on Pitching, then All-Time Totals, AL, and G). Major League Baseball. Retrieved December 5, 2011. 1 2 "Statistics" (To sort, click on Pitching, then All-Time Totals, the right arrow, and GF). Major League Baseball. Retrieved December 5, 2011. 1 2 "Red Ruffing Statistics". Baseball-Reference.com. Retrieved February 8, 2009. ↑ "Lefty Gomez Statistics". Baseball-Reference.com. Retrieved February 8, 2009. ↑ "Jack Warhop Statistics". Baseball-Reference.com. Retrieved February 8, 2009. ↑ "Roger Maris Statistics". Baseball-Reference.com. Retrieved February 8, 2009. ↑ "Single-Season Leaders & Records for Home Runs". Baseball-Reference.com. Retrieved February 11, 2009. ↑ "Single-Season Leaders & Records for RBI". Baseball-Reference.com. Retrieved February 11, 2009. ↑ "Single-Season Leaders & Records for Runs". Baseball-Reference.com. Retrieved February 11, 2009. 1 2 "Don Mattingly Statistics". Baseball-Reference.com. Retrieved February 8, 2009. ↑ "Steve Sax Statistics". Baseball-Reference.com. Retrieved February 8, 2009. ↑ "Earle Combs Statistics". Baseball-Reference.com. Retrieved February 8, 2009. ↑ "Rickey Henderson Statistics". Baseball-Reference.com. Retrieved February 7, 2009. ↑ "Alfonso Soriano Statistics". Baseball-Reference.com. Retrieved February 8, 2009. ↑ "Hitting Streaks". Major League Baseball. Retrieved February 9, 2009. ↑ "Single-Season Leaders & Records for Slugging %". Baseball-Reference.com. Retrieved February 11, 2009. ↑ "Single-Season Leaders & Records for Extra-Base Hits". Baseball-Reference.com. Retrieved February 11, 2009. ↑ "Single-Season Leaders & Records for Total Bases". Baseball-Reference.com. Retrieved February 11, 2009. ↑ "Single-Season Leaders & Records for OPS". Baseball-Reference.com. Retrieved February 11, 2009. ↑ "Single-Season Leaders & Records for Bases on Balls". Baseball-Reference.com. Retrieved February 11, 2009. 1 2 "Curtis Granderson". Baseball-Reference.com. Retrieved September 11, 2011. 1 2 3 4 "Jack Chesbro Statistics". Baseball-Reference.com. Retrieved February 9, 2009. ↑ "Single-Season Leaders & Records for Wins". Baseball-Reference.com. Retrieved February 11, 2009. ↑ "Joe Lake Statistics". Baseball-Reference.com. Retrieved February 9, 2009. 1 2 "Ron Guidry Statistics". Baseball-Reference.com. Retrieved February 9, 2009. ↑ "Spud Chandler Statistics". Baseball-Reference.com. Retrieved February 13, 2009. ↑ "Sad Sam Jones". Baseball-Reference.com. Retrieved November 14, 2015. ↑ "Jack Powell". Baseball-Reference.com. Retrieved November 14, 2015. ↑ "Paul Quantrill Statistics". Baseball-Reference.com. Retrieved February 9, 2009. ↑ "Single-Season Leaders & Records for Games Started". Baseball-Reference.com. Retrieved February 11, 2009. ↑ "Single-Season Leaders & Records for Comp. Games". Baseball-Reference.com. Retrieved February 12, 2009. ↑ "Yankees Single Game Records". Major League Baseball. Retrieved February 9, 2009. 1 2 "Yankees tie franchise record with eight homers in rout". ESPN. Associated Press. July 31, 2007. Retrieved February 9, 2009. ↑ Hoch, Bryan (August 25, 2011). "Yanks rout A's with MLB record three slams". Major League Baseball. Retrieved August 26, 2011. ↑ "Red Sox subdue Yanks in 10th inning, Rays draw level". ESPN. Associated Press. October 3, 2010. Retrieved May 12, 2015. ↑ Vasquez, Andy (May 10, 2015). "Michael Pineda fans 16 Orioles in Yankees' 6–2 win". The Bergen Record. Retrieved May 12, 2015. ↑ Witz, Billy (April 11, 2015). "After Seven Hours and 19 Innings, One Hit Sinks the Yankees". The New York Times. Retrieved April 20, 2015. ↑ Lowry, Philip J. (2010). Baseball's Longest Games: A Comprehensive Worldwide Record Book. McFarland Books. p. 201. ISBN 9780786457342. ↑ "Yankees Season Records". Major League Baseball. Retrieved February 10, 2009. ↑ Waldstein, David (October 3, 2012). "Yankees Finish With a Flourish, Capturing East". The New York Times. Retrieved October 3, 2012. ↑ "2015 New York Yankees". Baseball-Reference.com. Retrieved October 6, 2015. 1 2 "2016 New York Yankees". Baseball-Reference.com. Retrieved October 3, 2016.